· LBICAP is a low profile company; its trading of stock volume is low. i. PE low with 5.
ii. High ROE with 16.67%. iii. Acceptable DY with 3.56%. iv. High NTA with RM 1.66.
v. V. ROA with 10%. · But cash flow is the weakness of LBICAP, historical cash flow in category operating and financing activities giving bad result. · After deduct total bank borrowing from cash holding, LBICAP is a net negative cash company. · LBICAP should solve its cash problem to be a healthy cash company. · On the hand, free cash flow of LBICAP is showing healthy and it is increasing in yearly. · From earning valuation model, it giving intrinsic value RM 2.02. · The catalyst needed by LBICAP is new property development project. · In Greenblatt's Magic Formula, earning yield and return on capital giving 11% and 12%% respectively. · Property development is the source of revenue and revenue of LBICAP. Current LBICAP's townhouse project Desa Saujana 2 at side of completion period. · Second phase of industrial turnkey development I-Hub@Puchong expected launched this year. · Project in Section 14, PJ which h comprising 11 units bungalow expected launched by Q3''2015. · LBICAP also planning to redevelop earlier wet market plan into 24 units’ double storey shop office. · LBICAP’s bank borrowing need cleared soon because the maturity within one and two years amounted to RM 34,143,262. · There is uptrend on Revenue, Net profit and ROE since year 2011. 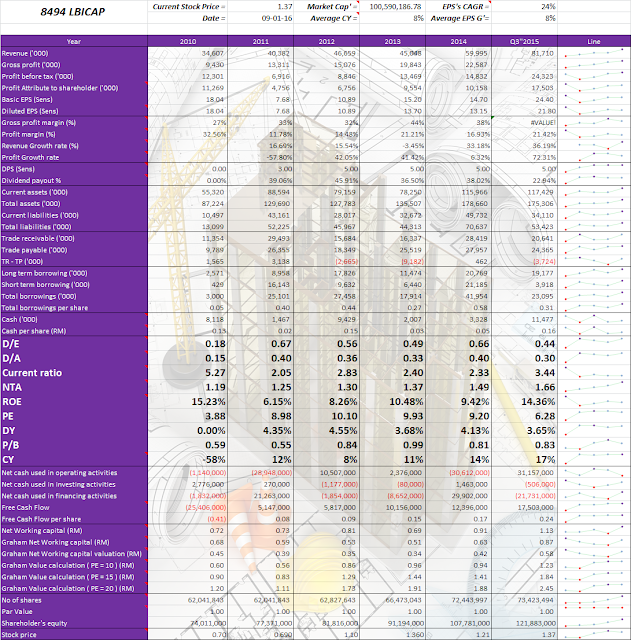 · Dividend is decreasing since year 2012 but the DY is maintained above 3%. i. RM 3.5 million clears bank borrowing. ii. RM 25 million acquires other land. iii. RM 18 million used on working capital. iv. Amount left charged by RPGT and expenses. · LBICAP's last buy back share is year 2010, and next is year 2015, is it management think the current price of LBICAP is undervalued?